So excited. 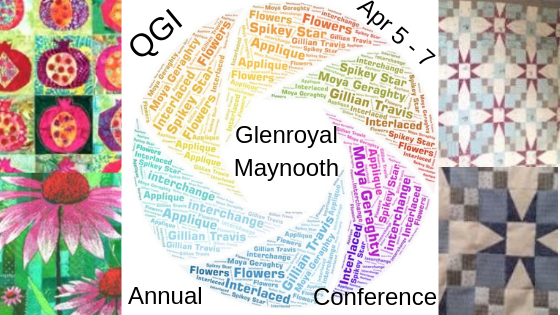 It’s the QGI Annual Conference Programme. Well? Were you as excited as Spongebob Squarepants, upon receipt of your QGI Annual Conference Programme? At least a few of you were, response has been really positive so far. Our Education Officer, Clare Loughrey has done us proud, it’s a beautiful booklet and has exciting classes for quilters of all kinds, with high quality tutors. Where: Glenroyal Hotel, Maynooth, Co Kildare. How: Places are allocated on a first come basis to FULLY PAID UP members. WARNING: We have more members at present than we have had in the past few years. So be warned, if you leave it too late, you may not get the class you want. In fact you may not get a class at all. We hope that won’t be the case and we don’t want you to be disappointed. Meanwhile, enjoy your Christmas, however or where ever you spend it. If you haven’t received your booklet and you’re a paid up member, please get in touch. You can access it from here, but we want to make sure our details are up-to-date. So, don’t just say to your friends, tell us. theqgi@gmail.com. Any queries – get in touch. Current members of the Quilter’s Guild of Ireland, will know that we’ve had a turbulent few months with one thing and another, but we’re delighted to announce that rumours of our demise are greatly exaggerated. The QGI AGM held in March 2018, for several reasons, deemed it necessary to ascertain whether or not we should continue as a Guild. Current members were informed in detail at each and every stage of our road to conducting the Ballot. Your small committee has already been working on the 2018 – 19 Season and partly in answer to suggestions made by our members, we are hoping to announce a few extras for the forthcoming year. Yet again, I do need to reiterate that help is always appreciated. Our Facebook page has been receiving a lot of attention since April 2018 and we now have over 950 followers and our messages regularly reach 1,500 people. While not everyone is on Facebook, it has proven a useful tool in marketing our presence. If you’re not on Facebook, postings may be viewed on the website. We have moved our website from Blogger to WordPress and in doing so have moved from .org to .com. The new URL is quiltersguildireland.com. Seems like a handful, but it is a better name for search engines to understand what we are all about, hence for quilters to find us. Why change platforms? Many reasons, not least being that Blogger (owned by Google) formerly a popular choice, have fallen behind in updating their software. WordPress offers excellent support and security. Our old website shall still be ‘active’ for the next few months. Don’t worry, all the material from the old website has been painstakingly moved across and placed in the archives. We wouldn’t want to lose our history. Oh and I should say that any comments/criticisms/suggestions will be gratefully received. This is the website for the members of the Quilting Guild of Ireland, therefore it represents you as a member. Our current banner was created by Mary Palmer of MArimu DEsigns Textile Craft. This piece entitled: ‘Lost in Translation II’ was the winner of the Modern Quilts Category at the 2018 Festival of Quilts.